“No ratings” refers to a system where employees are not given official ranks based on their skills and performance. Nowadays, more and more people are claiming that assigning ranks does not in fact lead to better performance or business. There is also an increasingly strong movement towards adopting the “no ratings” system that is common in western companies. 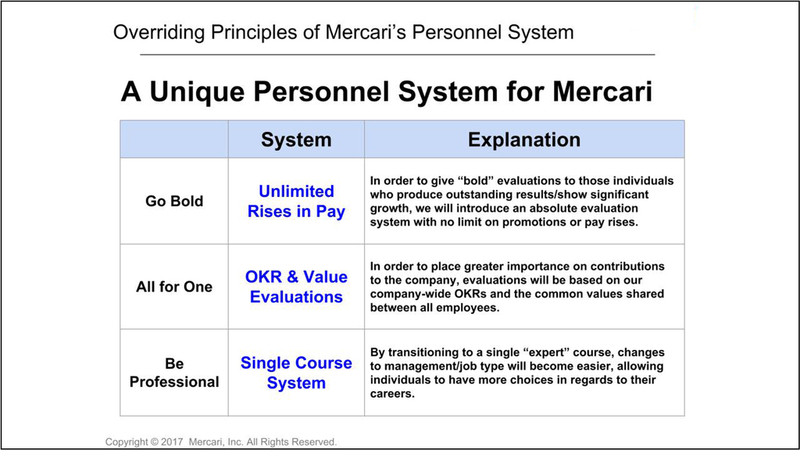 Mercari reformed its evaluation system in January 2018, making a clean transition to a “no ratings” and “absolute evaluation” system. 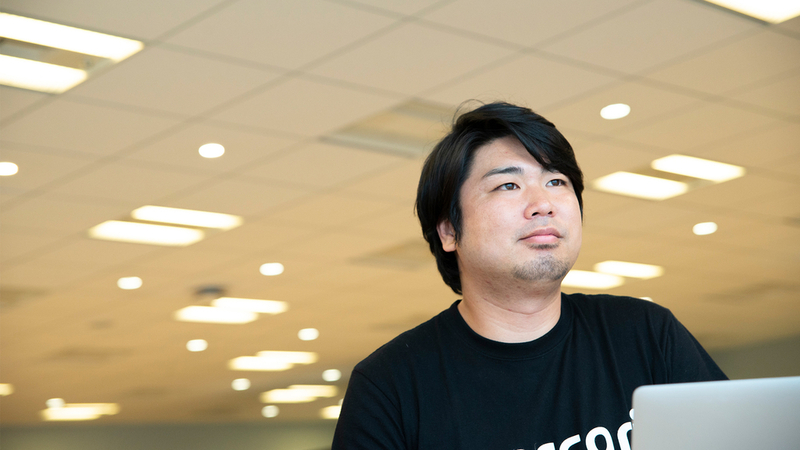 We interviewed the People Experience (PX) team’s Hiroyuki Takahashi, one of the members who helped lead this transition. 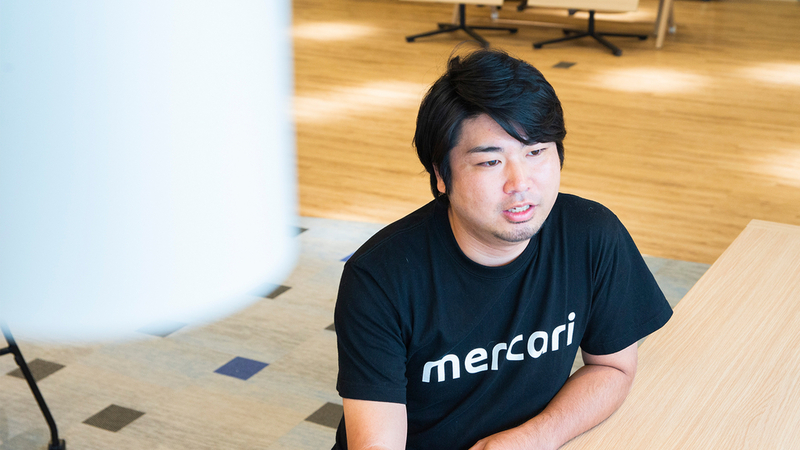 As we discussed the current situation and the story behind the transition, we gained some valuable insight about Mercari’s policies and visions for the future as a global tech company. ーCan you describe the new evaluation system to us? Takahashi： Sure. 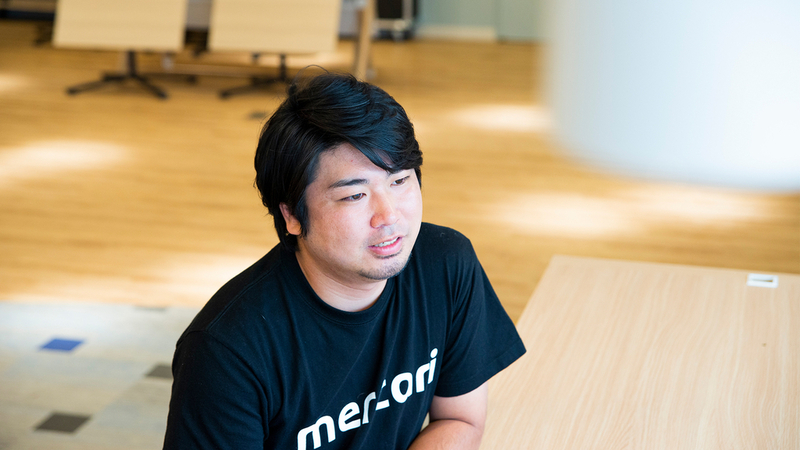 To put it simply, it’s a system that helps Mercari evaluate members based more on performance. Our “Be Professional” value has always been a guiding principle, but our new evaluation system aims to evaluate individuals based on how they embody the company values and what kind of performance they achieve. ーSo it’s a system based on Mercari’s values. What are some of the specific changes that were made? Takahashi：We’ve established a system where members are not rated according to a common rank system, but evaluated on an absolute scale. This is closely related to the executives’ hopes for employees. Ratings involve giving members titles like “rank S,” “rank A,” or “rank B,” and evaluating them accordingly. When an organization has over 1000 members, costs and authority are often delegated to lower levels, with funds allocated to each department or team to perform evaluations using their own evaluation methods. However, Mercari does not set a limit on how much funds are available to cover all pay raises. What we aimed to do was establish a system that evaluates individuals based on their performance. ーSo rather than a “top down” evaluation approach based on allocations, you’ve established a “bottom up” approach. Are there any other changes? Takahashi：Well, we separated grades and management positions. ーWhat do you mean by that? Takahashi：Before, with the exception of engineers, you couldn’t advance past a certain grade unless you became a manager. 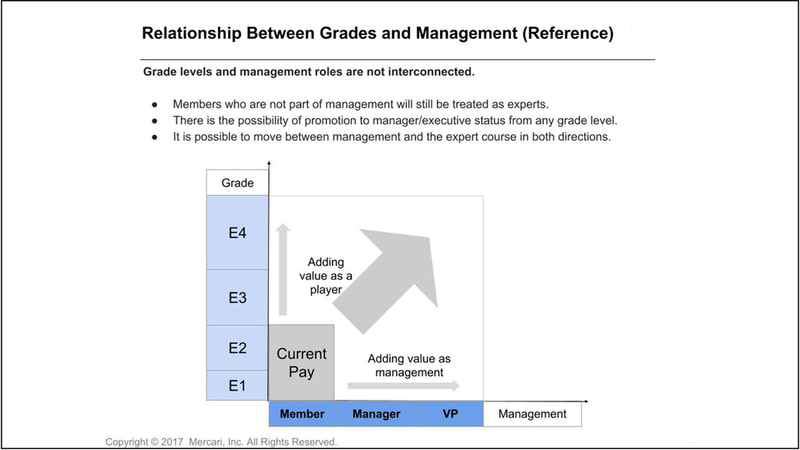 With the new system, we’ve eliminated the relationship between management and grades. “We don’t work under official positions” is a phrase commonly heard at Mercari. A manager works to maximize the organization’s performance, but that’s a role, not a position. If someone is skilled at management, they can become a manager. At the same time, if someone prefers to specialize in their current position as a team member, they can continue as one and simply have their grade raised. This leads to more career choices, as well as an increase of talent. This is another big feature of the new evaluation system. ーNow that you’ve established the new evaluation system, what’s really important is what happens next, right? Takahashi：That’s right. Every day, we handle various tasks while working with the new system. In the evaluation flow, the manager is the first one to evaluate their team members. Afterwards, the managers meet to have a “calibration” meeting where they make sure that the first evaluation was done fairly. ーSo evaluations always involve a third party. Did you find any new tasks or challenges while using this system? Takahashi：There’s a lot to be done, but I would say that there are two main challenges. One is that when managers suggest a pay raise in calibration meetings, there are no set rules regarding how much pay can be raised, so it can be difficult to logically decide on an amount. ーThat’s true. It can be hard to make a fair evaluation when there are no set rules. Takahashi：What we want in this situation is the evaluating manager’s “market sense.” This is kind of a serious topic, but it means being able to determine how much market value each member has. A no rating system requiring that kind of perspective and knowledge is no doubt a difficult system for managers to work with. The second challenge is the high cost of calibration. This is an issue that will grow as the number of employees increases. ーSo why is it that you continue doing these calibrations? Takahashi：Because I think that the most important part of conducting evaluations is gaining the understanding and agreement of all members. It doesn’t really matter what method is used, as long as all members agree with the feedback they receive. I’d like to do everything possible to make that happen. Having calibration and getting the perspective of other managers also allows us to provide much more accurate feedback. Calibration may involve high costs, but I think that it should be done because it ensures that members are satisfied with their feedback. Of course, the system isn’t perfect and there’s still a lot that can be done to improve it. ーWhy did Mercari adopt this “no rating” and “absolute evaluation” system in the first place? Takahashi：I think there are two reasons. One is executives’ hopes for employees. We want to make sure that all members receive accurate feedback reflecting their performance. We didn’t want a strict system with salary charts and arbitrary limits in place. The other reason is Mercari’s culture. In line with our company values, we have many members aiming to be professionals, and I think that they are more comfortable being evaluated based on their output and performance. ーSo it’s a system where the executives and members’ thoughts are in line with each other. Takahashi：That’s right. To be honest, having no ratings and an absolute evaluation system can be a dark tunnel for the people involved. Actually trying to use this kind of system leads to even more complications. We wouldn’t have to deal with calibration costs if we used an ordinary system with ratings and distributed funds, and it would simplify the overall evaluation process. 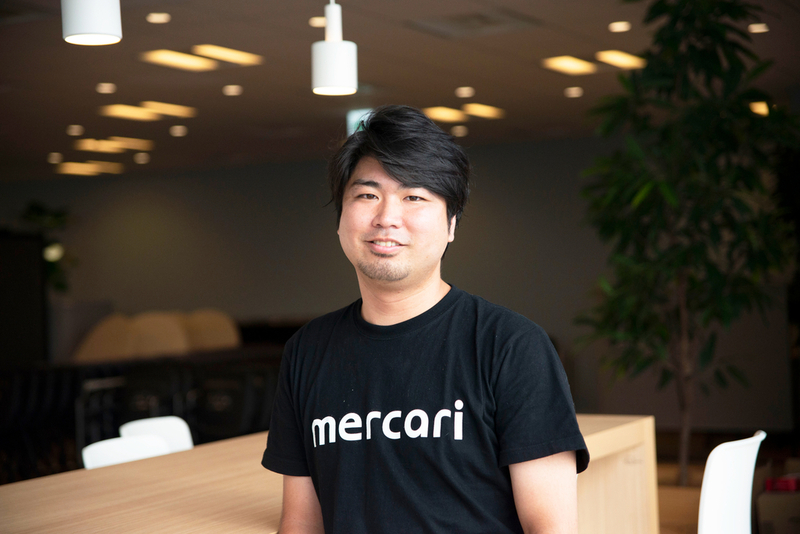 However, Mercari strives to be a company where members are evaluated by their performance as much as possible, and I believe that everyone agrees with the executives regarding this. ーLastly, can you tell us about what you have planned for the new system in the future? Takahashi：The first thing will be implementing an evaluation system that can be used globally. Everything I’ve talked about up until now has been about the system used in Japan, but a global system is currently in the works. 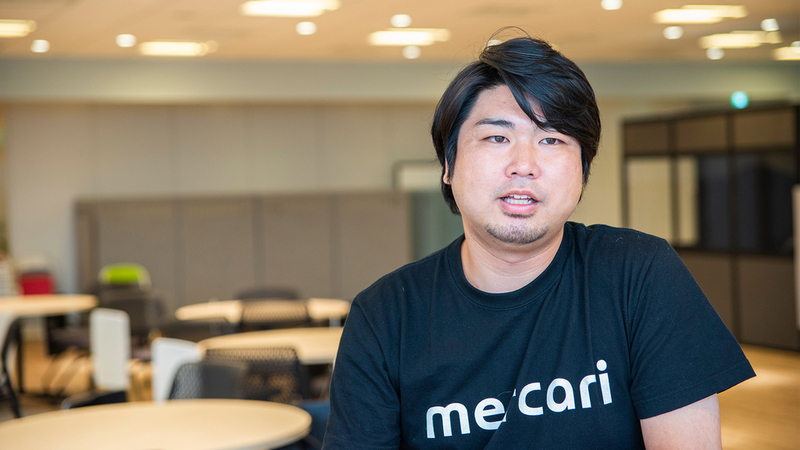 We’re expecting personnel transfers to become more and more frequent, and if that happens, it will be necessary for the Mercari Group to have a unified system. At this very moment we’re discussing whether we should choose the no rating system currently used in Japan, or if we should go with a system with ratings. ーSo even if the methods change, the goal here is consistency. Takahashi：Although we’re using a no rating and absolute evaluation system, it’s important that we aren’t too persistent about keeping it. We want to always have the best evaluation system available, and sometimes this requires bold moves like discarding what we’ve been using in favor of something completely new. Moving forward, we hope to maintain a system that all members can be happy with. There isn’t one correct answer, but what we want to do is maintain a Mercari-like environment and culture for everyone. Joined Intelligence, Inc. after graduating from university and worked in recruiting. Later joined Mixi, Inc. and began a career in HR, focusing on hiring engineers. Joined Colopl, Inc. afterwards and worked as a manager for personnel and labor, with a focus on hiring new graduates and mid-career candidates, system planning, and HR as a whole. Joined Mercari in 2016. Chats with Engineers, vol. 18 (2018 New Grad Edition): @makazutaka, @codehex, do you have a minute?